Elena Belyea as Tick. Photo by Lauren Garbut. If you had to choose between watching a solar eclipse or rebelling against a higher power, which would you opt for? For the intelligent and free-spirited characters in Matt Mackenzie’s Tick the decision isn’t an easy one. On Tuesday February 21st in E.I McCulley Elementary School’s gymnasium, Carousel Players put on an energetic and empowering performance—directed by Jessica Carmichael—about the importance of friendship and standing up for a cause you believe in. 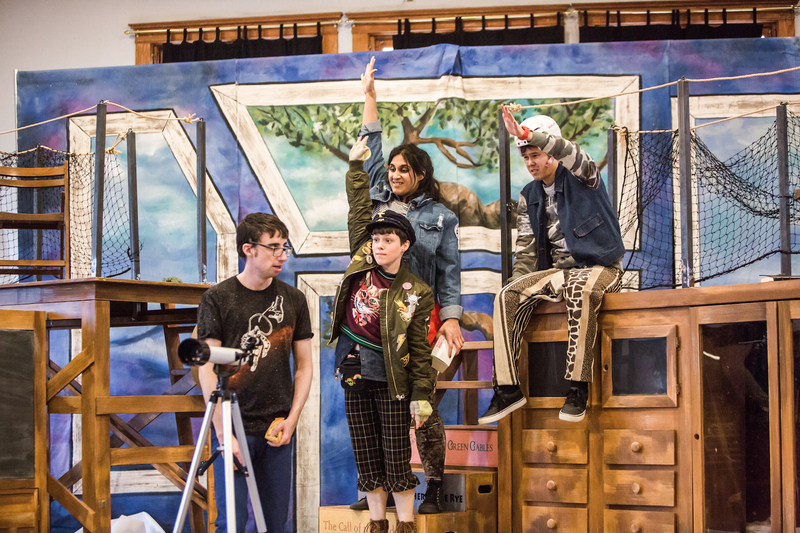 Tick (Elena Belyea) is a rambunctious and intelligent young leader who, after hearing that the local library in her town is swapping out real books for digital ones, becomes enraged and conjures a plan to rally the kids in the neighborhood. There’s just one thing standing in her way: the vicious dictator that implemented this injustice is her mom (Sehar Bhojani)’s boyfriend Murray (Philip Nozuka), head of the city council. Tick must now gather her three friends: Rudeger (Simon Bracken) the space genius, Dawn (Bhojani) the hockey star, and Chelsea (Nozuka) the animal enthusiast, to devise a plan of attack. Seems easy enough, until Tick’s plan causes conflict within the group. What follows is a series of tough lessons learned about the importance of friendship, empathy, and compromise. A seemingly one-dimensional set—steps centre stage painted like books, two large sheets resembling wooden walls, and a four-window backdrop looking onto a blue sky—quickly subverts expectations as it is continually transformed throughout the performance. 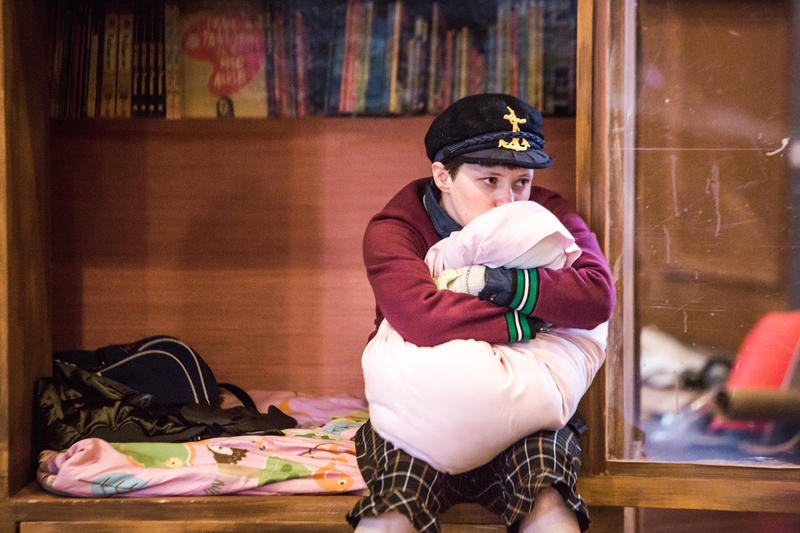 Designer Jenna McCutchen has created a world where anything is possible, in which a wooden platform becomes the bow of a pirate ship, and a large cupboard becomes a young girl’s refuge. The set pieces work like a puzzle, maneuvered by the actors, reflecting the imaginations of the younger characters—this is their world and they are working to enact change. Also designed by McCutchen are the costumes—as there are only four actors playing nine characters, costumes had to be easily removable for quick-changes. In distinguishing between the characters of Murray and Chelsea, and between Tick’s mom and Dawn, McCutchen has cleverly given each adult character a blazer to wear on top of their base costume. This simple addition gives the adult characters a functional and professional look, and along with the actors’ shifts in physicality and voice pattern the transformation is extraordinary. Costume design also plays a crucial role in reflecting the personalities and talents of the characters—Murray’s crazy giraffe print pants reflect his energetic and goofy nature, while Tick’s multi-layer, multi-color ensemble reflects her whimsical and creative mind. Simon Bracken, Elena Belyea, Sehar Bhojani, Philip Nozuka. Photo by Lauren Garbut. Considering that this play is performed for children, the cast subverts my expectations of what constitutes a so-called kids’ show. 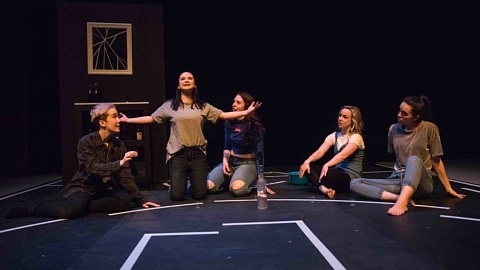 Playwright Mackenzie produces four smart and ambitious characters whose dialogue is witty, inspiring, and thoughtful. 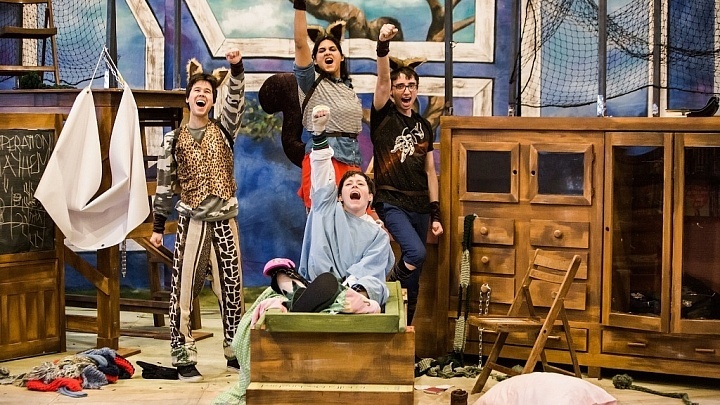 All too often I have seen children’s theatre that patronizes audiences and actors that play up childishness, but here Belyea has endowed the character of Tick with a confidence and strength that garnered an enthusiastic response from the children in the gymnasium. Rather than focusing on the fact that Rudegar is a child, Bracken focuses his performance on the character’s passion for outer space, love of knowledge, and sense of devotion when it comes to his friends. 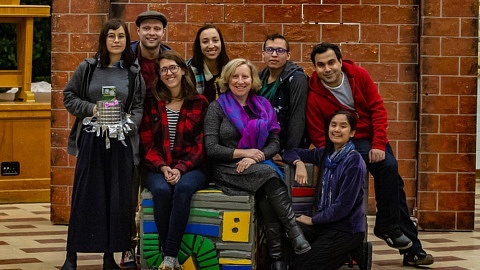 The success of the impact of the play was reflected in the Q & A that cast held at the end of the performance: the children attending were enthusiastic and asked thoughtful questions about the actors’ process, character relationships, and technical aspects of the show. 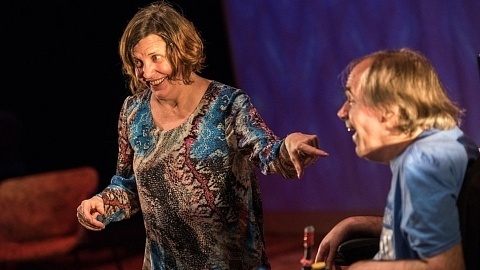 Matt Mackenzie’s Tick may be classified as a children’s play, but standing up for a cause you are passionate about is at the core of this performance and that is anything but childish. Director Jessica Carmichael, along with the actors and designers at Carousel Players’ bring to life a world where anything is possible, as long as you remember who your friends are.